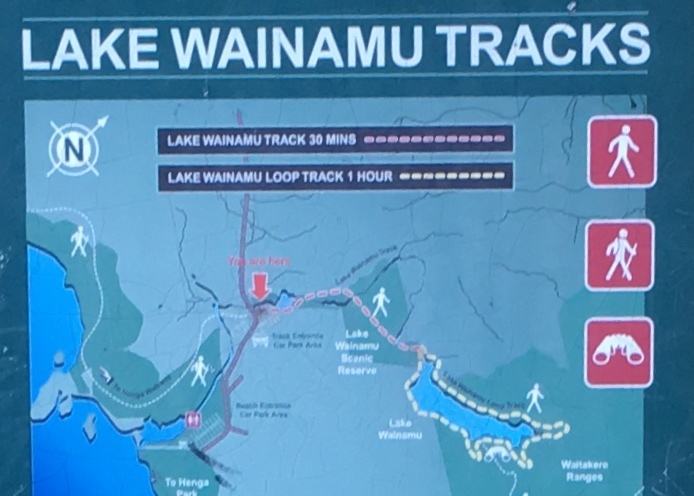 I’ve never been that keen on adding the Lake Wainamu Tracks to my trail running rota as the couple of times I’ve visited the area (specifically to run the dunes), it’s just been vast amounts of trekking over soft sand, which I didn’t envisage as an ideal trail running environment. My curiosity however, was peaked when I came across a blog post that included photos which looked like they were taken in the bush area next to the dunes. 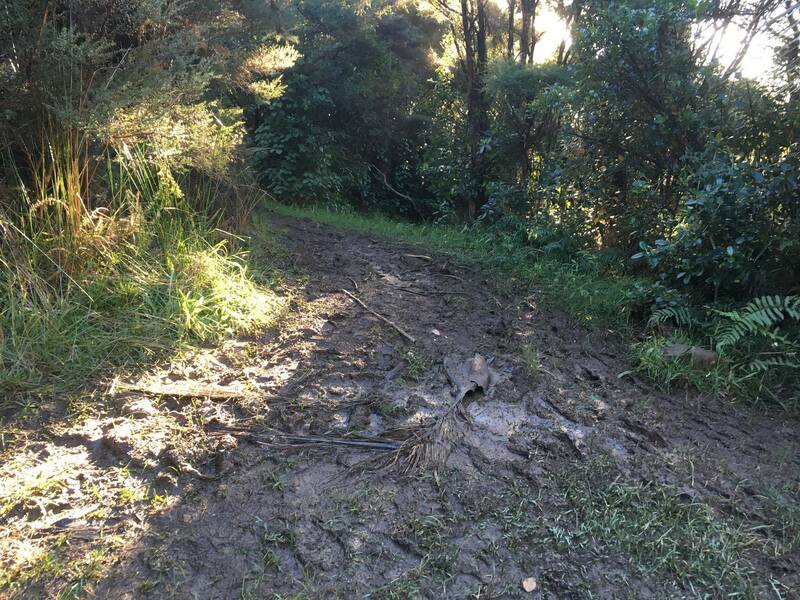 So, despite my earlier reservations I decided that my last scheduled run prior to going to Rotorua would be an opportune time to explore the area as it was a scheduled “easy run” day, therefore if I couldn’t find the trail I’d seen pictured or it just wasn’t a very running conducive environment it wouldn’t really matter – at least I’d be spending time on my feet. 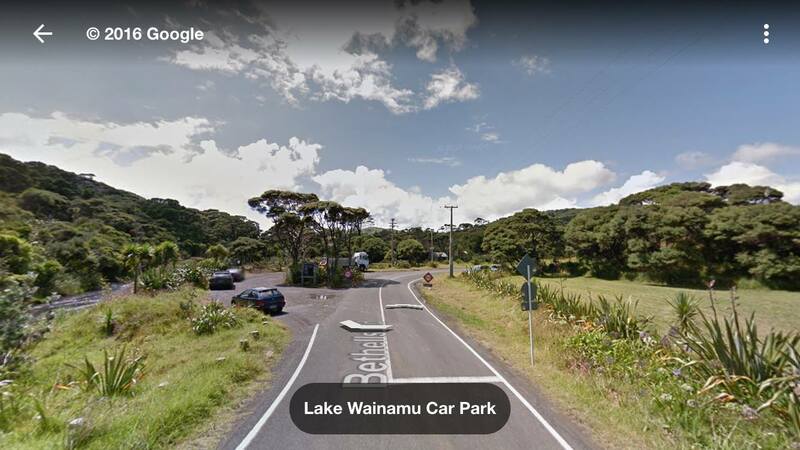 The Lake Wainamu Track starts from the car parking area on the left just after you cross the white single lane bridge on Bethells Road (heading towards Bethells Beach) and then links up with the Wainamu Loop Track which circumnavigates the lake itself. On the left is the carpark and entrance to the track is behind the gate. The first section of the track follows along side the Waiti stream and as you near the dunes you are given the choice to reach the lake by continuing to follow the stream (estimated to take 25 minutes) or trek across the dunes (listed at 20 minutes). I elected to cross the dunes and if you are coming to run the trail I strongly suggest you take this option unless you enjoy running with water logged (and sand filled) shoes. If you do elect to cross the dunes, there is no track as such, but keep heading in the same direction you have been traveling in until the lake comes into sight, then it’s a simple case of running towards it. When you reach the lake, follow the waterline to the right where you’ll see the entrance of the Loop Track. Don’t forget to lock the gate behind you! I was pleasantly surprised to find that once you pass through the gate, the Loop Track is more akin to the trails I am accustomed too, although sections of it are remarkably narrow considering how many tramping groups come through here. It wouldn’t be West AKL without some good old mud! At the falls I was a little confused as to how I’d reach the other side to continue along the track. I climbed up past the Maori carving (for a better look at the falls and to see if I could spot a trail) but unfortunately the falls were quite dry (so nowhere near as dramatic as photos I had seen online) and I couldn’t see any sign of a trail, so I headed back down to the trail I had originally been on and just walked through the grass in the general direction of where I thought the trail “should be” and I did eventually find a gravel path on the other side. The path on this side of the lake varies with everything from packed gravel, to mud, dry compacted earth and long grass, it was also cooler as the mountainside blocked out much of the afternoon sun. The views however were just as amazing. The track is reasonably easy to follow and I only had to double back once as I continued to follow a flattened grass track (to private property) where I should have made my way down to the stream edge. When you reach the stream edge there is no track to follow (except for the stream itself) and your feet will get wet even if you try your best to skirt along the dunes (although I didn’t bother) however, considering I ended up with about 2kgs of sand in my wet shoes perhaps I should have. 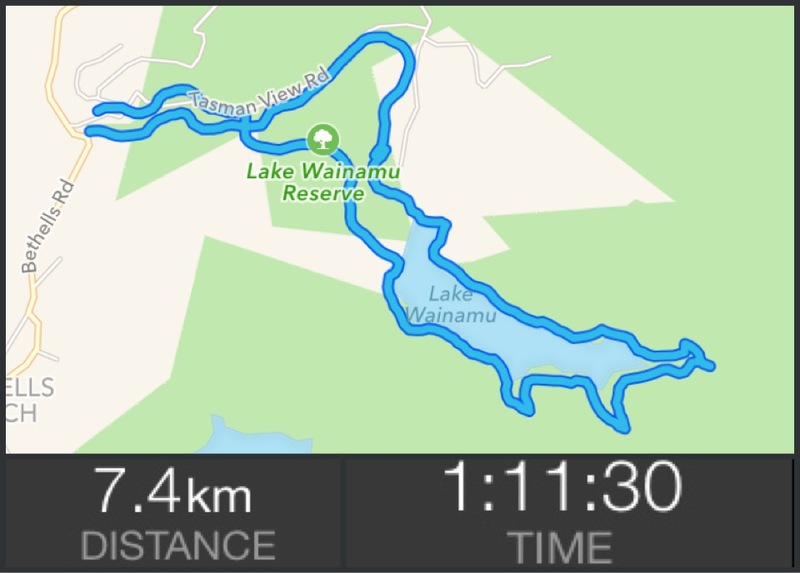 All in all, even though I hate having wet feet (although if given a choice I’d rather run through water than the freezingness that is Rotorua) it was the best run I’ve had in ages and the views are simply sublime! If the car park is full, there is a much larger car park across the road. Head back towards the bridge and turn into the driveway just before it on the left. 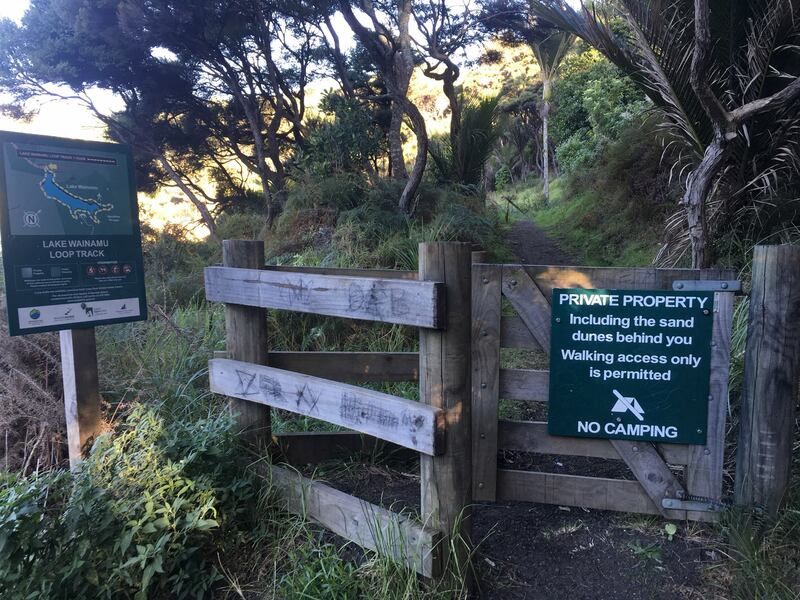 (It’s marked Te Henga Walkway) drive to the end and park at the start of the Te Henga Walkway. There is a water tap located here too – go across the footbridge and it’s located to the left just before the first gate. 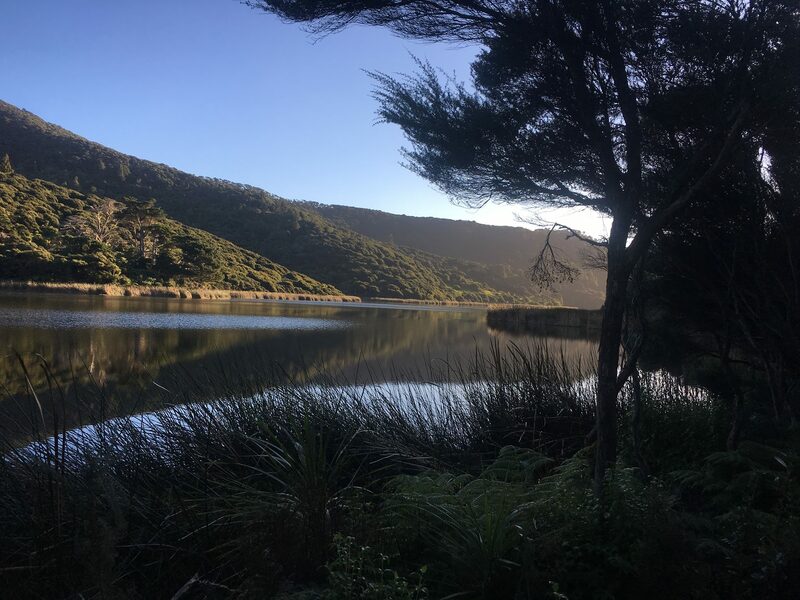 There are no toilet facilities at either of the car parking areas, your options are to head down to the main beach (5 minutes) or wait and use the toilets located on the dunes before you reach the lake – you can’t miss them, they are the only structure out there. There is NO cellphone coverage! Come prepared and let someone know where you are going and what time you expect to be back.